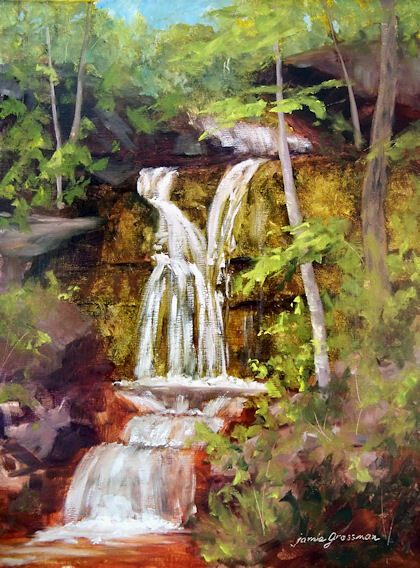 I’ve been wanting to paint this waterfall for such a long time! Over half of it is this beautiful rock ledge covered with the most gorgeous green moss I’ve ever seen. I finally had my opportunity when the sun broke out briefly on Saturday. I did end up having to pack up quickly in the rain and finish it up in the studio, but it was a thrill to be out there painting for awhile. As far as I know, this waterfall has no name, so I call it Mossy Falls. I’d guess it to be about 25-30 feet high. 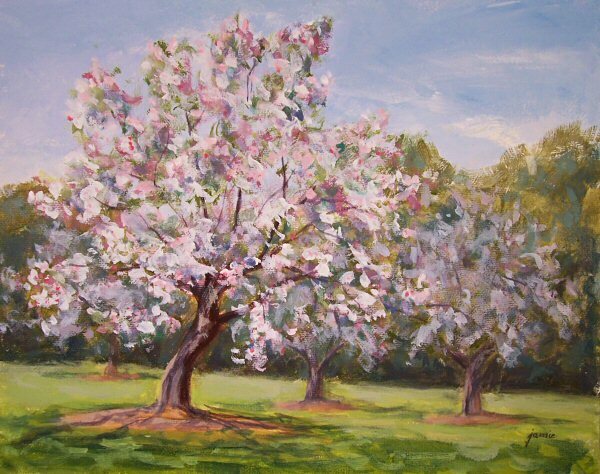 This painting was started on location in the apple orchard at Lasdon Arboretum in Somers, New York. I was about a half hour away from completion when thick clouds moved in and it started to rain! I had to pack up quickly and return home. Fortunately, I got a photo while the light was still good, and finished it from the photograph. 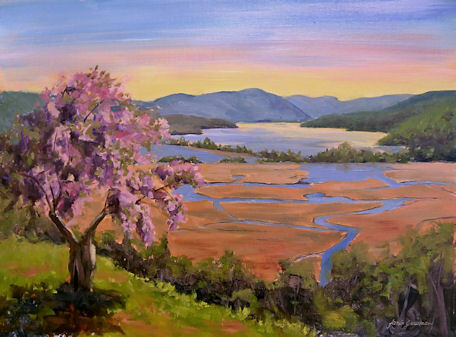 Every spring I go to paint the Cherry Blossom trees at Boscobel Restoration, high above Constitution Marsh and the Hudson River across from West Point. This spring I was sure I’d missed the boat in terms of the cherry blossoms, so I was thrilled to see a few trees still in full bloom when I arrived there yesterday morning. The marsh still has its nice spring color — orangy red in the morning, turning to dark violet by late afternoon as the sun marches across the sky. 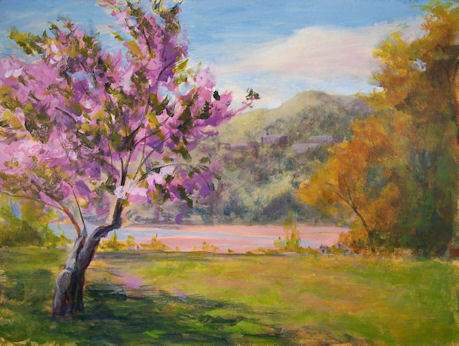 In a few weeks, that will all give way to the greens of summer, and all of the extraordinary color will be gone. This is the view from Boscobel Restoration in Garrison, New York, looking down the Hudson River, with West Point Military Academy on the far shore. 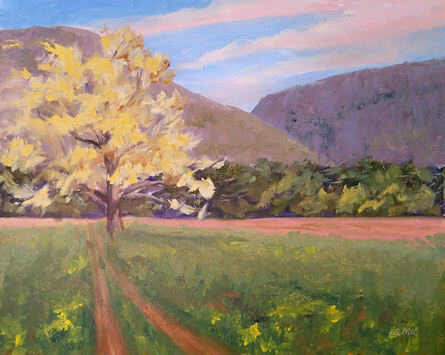 This was painted on location over the weekend in the Catskills. I definitely want to revisit this location a few more times. $335.00 plus free shipping and insurance within the Continental United States. For local sales, shipping charge will be allocated to NYS Sales Tax. Please email me at JamieWG@aol.com for International purchases or with any questions. This was painted at Boscobel Restoration in Garrison, New York. To my dismay, most of the cherry blossoms had come down in the strong winds during the week. I found this one tree that still had blooms on it, and pulled out my artistic license to add a few more. From this vantage point at Boscobel, Constitution Marsh stretches out below, and the West Point Military Academy is on the hillside across the Hudson River. 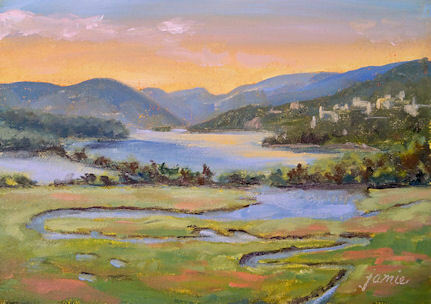 You can barely make out the buildings of West Point on the hillside in the painting.